Mainstream economic policy is full of misrepresentation of reality. Propositions like ‘business tax cuts create jobs’, ‘income inequality exists because workers are not productive’, ‘free trade benefits everyone’, ‘inflation is always due to too much money chasing too few goods’, ‘the subprime mortgage crash of 2007-08 was caused by a ‘global savings glut’, ‘the US federal reserve central bank is independent of private bankers and politicians’, ‘markets are always efficient’, ‘recessions are caused by external shocks to an otherwise stable (equilibrium) system’, and so on–propositions the function of which are to justify economic policies that redistribute income and wealth to the wealthiest 5% investor class and their business institutions institutions (corporate and non-corporate). From the ideological policy propositions in turn are created even higher level theoretical concepts like ‘Phillips Curves’ and ‘Laffer Curves’ that encompass and one or more of the policy propositions and simplify them for selling them to the public and media. This is all ‘economic ideology’, in contrast to economic science which looks at empirical data and accurately reflects and represents that data. Ideology is about mis-representation of data, facts and therefore reality. Misrepresentation is not simply about error of analyses. Errors of analysis occur in any science. They are not intentional. Misrepresentation is conscious, intentional and with a purpose. Ideology in economic policy is also always the product as well of an institutional framework, the task of which in a social system is to produce misrepresentations in the interests of a particular class or group that ultimately funds the work. That institutional framework may be corporate think tanks, editorial pages of the major business and mainstream media, talking heads on cable tv networks, fake social media outlets created by those interests, academia that trains the future ideologists–to name just the most obvious. You know, the ‘tobacco doesn’t cause cancer’, carbon from human activity doesn’t cause global warming’, etc. Take just one example of recent ideology in economic policy: the Trump tax cuts (and all the major tax cutting legislation since Reagan 1981–both Republican and Democrat alike). The recent $5 trillion given to investors, corporations, and non-corporation businesses by the Trump tax cuts were ‘sold’ by the claim that business tax cutting creates jobs. In fact, every major tax cut legislation since Reagan has been entitled in part as a ‘jobs act’. Most recently, George W. Bush cut taxes by $3.7 trillion–80% of which accrued to the 1% and their institutions. 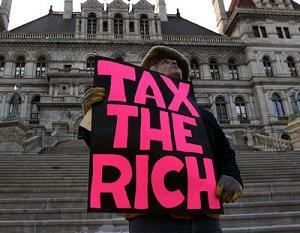 Obama followed with more than $5 trillion in tax cuts for the wealthy from 2008 through 2013 (and the decade beyond). Trump has added another $5 trillion through 2028. (Reported as only $1.5 trillion, after a $2 trillion hike in middle class taxes and another $1.5 trillion in absurd assumptions about 4% GDP for another ten years without a recession). But there’s no direct causation evidence of jobs created due directly to the Bush-Obama-Trump tax cuts. There may be correlations, but one of the many tasks of Ideology in Economic Policy is to manipulate statistics, logic and language to claim correlations are causation. Jobs maybe created during the period in which the particular tax cut is enacted, but that doesn’t mean the extra income for the 1% and corporations is directed into real investment that creates new jobs. Just look at the Trump tax cuts thus far. Where has the money gone? The US Treasury, according to recent reports, has lost nearly $500 billion in corporate tax revenue alone so far in 2018. Meanwhile, corporate stock buybacks and dividend payouts to investors are on track to reach more than $1.3 trillion this year–following the last six years in a row during which more than $1 trillion was distributed each year, every year, to shareholders. Thus a credible, just as likely interpretation of where the tax cuts have been going, is they are flowing into stock markets (keeping them rising) and to investors’ capital gains rather than into job creating real investment in structures, equipment, or inventories. Jobs may have been created, but that does not mean created due to the tax cuts. Correlations are not causation–although a typical ‘language game’ and manipulation of ideology in economics is to argue that a correlation is causation. The business tax cuts create jobs proposition has its origins in neoclassical economics of the 19th century. The logical argument then was that if business costs were reduced, it would raise business disposable income, which in turn would be committed to business real investment and expansion. Business would not sit on the extra income or hoard it. It would invest it to become more productive and thus more competitive. And investing it would create jobs. But the hidden assumption was not only would reinvestment of the more disposable income occur, but there would be no delay in time. The time factor was conveniently left out in the logical (mis)assumption that tax cuts (aka more income) would result in more investment and more jobs. This proposition showed the oft-characteristic of ideology in which it is assumed the time element plays no role. A hallmark of ideological propositions is that they are often ‘timeless’. And that’s true today as well with the proposition that ‘business tax cuts create jobs’. Thus, assuming correlations are causation and ‘de-temporization’ are but two language games and ideological manipulation played by politicians and media in claiming that ‘business tax cuts create jobs’. There are more. Simultaneous with Trump tax cuts are creating jobs ideological messaging, the Government’s Bureau of Economic Analysis (BEA, a division of the Commerce Dept.) last week reported that US households have more income than thought. Overnight, the BEA changed US households’ savings rate from a 2017 low of 3.3% of their income saved to a 7.2% rate–a more than doubling of the savings rate overnight. What is one to make of this abrupt, radical change? Are government statisticians redefining facts to suit politicians’ demands to make US households and the economy appear far better than they actually are before national elections in November? Have they gone off the deep end of ‘false facts’ in the age of Trump? Is there a conspiracy? The answer is no to all the above. Ideological manipulation does not require blatant, outright lying. Ideology is often built around a kernel of truth. Ideological propositions may contain many truthful elements. Ideology is about manipulating those elements to produce a different meaning, sometimes fundamentally different. The BEA data change reverses the long standing economics notion that higher savings rates mean less consumer spending and, conversely, lower savings rates reflect consumers draining their savings in order to fund their consumption. The BEA changes suggest households haven’t been steadily draining their savings in order to maintain consumption, as their wages stagnated or declined, as previously thought. If consumption continues to rise in the US, it must be because wages are rising. The high 7.2% savings rate thus supports the other media hype that rising wages must be supporting US consumption. As a result of the savings rate increase, US households are actually $615 billion richer, “recovered from between the statistical couch cushions”, according to one Wall St. Journal report. The ideological conclusion is that workers must actually be getting richer since 2010, not struggling with stagnant wage gains as was thought the case. Consumption is rising, and its not due to households’ reducing their savings to pay for it, so it must be that wages are actually rising too. That the vast majority of US households are now at record levels of more than $4 trillion in credit card, student loan, auto loan, and installment debt is not raised as an alternate explanation of rising consumption amid stagnating wages. Ignore the role of credit and debt. If the savings rate is high, then consumption can be explained only due to rising wages. More savings means more income and more income must mean higher wages is the logical relationship between the variables. Just exclude the debt variable altogether. That would only negate the rising wages claims being propounded by politicians and media alike. What this shows is that logic assumptions may be used to obfuscate the facts, to cover up or distort economic reality, and not just reveal it. Manipulate the logic with language games may mis-represent reality. That’s ideology as well. If one digs deeper into the BEA savings rate report, some interesting details appear that suggest further ideological manipulation at work. According to a recent Wall St. Journal article (August 20, 2018, p. 2), the $615 billion in additional savings for the first three months of 2018 breaks down into $129 billion more for proprietors’ (non-corporate) business income, $73 billion in interest income, and $141 billion for dividend income. Employee compensation was increased by $100 billion. How that $100 billion was distributed among the high salaried executives and CEOs and managers in the form of annual bonuses and other salary forms, and how much went to the remaining bottom 80% of hourly wage earner, was not clarified in the media reporting. Nor was whether the $100 billion in employee compensation included stock cash outs. Even more conspicuously missing in the business media reporting was where did the remaining $172 billion ($615 minus the above) savings increase go? It appears that since corporations save too, that may have explained the simultaneous BNA upward adjustment of corporate profits. What the missing elements in the press suggest is that Ideological mis-representation may thus take the form of omission of facts, not just committing mis-representation on reported facts. One may distort the appearance of reality not only by changing reported numbers, but by simply leaving them out. By deleting them. Ideological mis-representation functions not only by assuming correlations are causation, or by inserting new data into an original proposition, or inverting logic and arguments, but by deleting or removing data or logical arguments. Since much of the $615 billion BEA savings adjustments for the first quarter 2018 are likely associated with the Trump tax cuts, one may conclude that the hike in the savings rate from 3.3% to 7.2% is a one time effect reflecting those tax cuts. First quarter 2018 US government tax revenues declined by more than $500 billion; much of that went in the short term to boosting savings of the wealthy. But no, the BEA assumes the Trump tax effect on households’ savings is not a temporary, one time effect. The BEA has made the effect retroactive to previous years as well, before the tax cuts boosted savings. The new upward revisions in savings totals for the first quarter of this year are assumed to be permanent. This making permanent of what may be temporary is an example of ideological manipulation of time, or what’s called the ‘de-temporization’ technique that was noted previously as well in the discussion of the tax cuts create jobs ideological proposition.